Medical experts agree that pregnant women free from any obstetric and medical problems should participate in 30-minutes of moderate intensity exercise on most, if not all, days of the week. Prenatal exercise is not limited to just cardio; strength training will help increase or maintain a woman’s overall strength and fitness level. As a personal trainer the biggest misconception I hear about exercising during pregnancy is that a women should avoid abdominal exercises. Your abdominals are an integral component of your core. A strong core is needed to minimize lower back pain, help you carry your baby safely and reduce injury during pregnancy and postpartum – among the many other benefits of prenatal exercise. Here are our top three prenatal exercises to strengthen mom’s core through all stages of pregnancy. The diaphragm is one of the core muscles and it’s designed to work in partnership with the pelvic floor and transverse abdominal (TVA) muscles, therefore making a conscious connection of these muscles is paramount to healthy pelvic floor and strong core. Understanding this belly breathing technique and having a great core connection can enhance your postnatal recovery and assist with abdominal wall separation (diastasis recti) repair. Make sure your body is aligned correctly with a natural curvature of the spine – you can ensure this by allowing your bum to sit naturally behind you (not tucked under) and your rib cage aligned above your hips. On the inhale – with neutral spine, place your hands on your lower rib cage and feel ribs expand into your hands. Chest should remain relatively still, pelvic floor should really relax and lower as the diaphragm lowers, allowing air to enter. As you exhale – allow air to expel slowly, closing the rib cage around your spine, feeling pelvic floor lift up gently (not like a full strength pelvic floor contraction, just a subtle lift) in connection with rising diaphragm, and allow the natural engagement of your transverse abdominals as they work in unison with pelvic floor. Practice belly breathes for 1-2 minutes. Belly Breathing is the antidote for this fight or flight type breathing and will not only assist you strengthen your core, but also bring more calm into your world. Cat / Cow is my all time favorite gentle stretch and strengthening exercise for back and abdominals. I like to call this move the pregnant mama’s ‘crunch’. When in the ‘cat’ position (middle back reaching toward ceiling) focus on engaging your pelvic floor and shortening your deep abdominal muscles by giving your baby a hug. To begin: Start on your hands and knees with a flat back, aligning your wrists so that they are directly beneath your shoulders, and your knees directly beneath your hips. Alignment is important to prevent injury and create maximum support by the natural stacking of your bones. Linking your deep belly breaths to your movements, inhale to arch your back, reaching your tailbone to the sky and chest forward (cow), avoid crunching your neck by looking upward; instead gaze softly forward, keeping your neck long. With exhalation, round your spine, expelling all of the air with the slight squeezing of your belly, your head and tailbone reach for the ground as your middle back reaches for the sky (cat). Let your head and neck follow the movements of your spine. Gentle move through this range of motion. Repeat 5-7 times. Squatting exercises are some of the best you can do in pregnancy to improve your posture and support the pelvis. To boost the benefit of a squat, I love using a Body Bar (as pictured) or hold weight at chest to perform squat to engage upper postural muscles. Note: Squats in pregnancy serve another important purpose, and that is activation of your pelvic floor muscles. On the way up from the bottom of your squat, give a gentle pelvic floor contraction (e.g. kegel)—as if picking up a bean with your pelvic floor muscles. 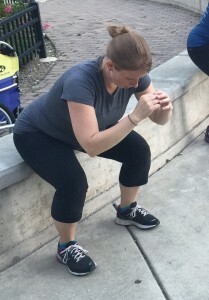 Fully relax your pelvic floor muscles at the top of your squat. Stand with feet shoulder width apart (or wider to accommodate belly), pelvis neutral, and body weight is slightly back on heels. Exhale and “hug your baby” as your return to standing position by pressing through heals. This is one rep.
Give yourself and your baby every advantage of exercise. Let AMC help you navigate the do’s & dont’s of prenatal exercise. No previous exercise experience is required for our Small Group Prenatal Fitness program. Visit our website to learn more and to get started.